1. To produce exact reproductions, as of documents. 2. To send a message or document via a special machine or method on the internet. In medicine, the imperfect absorption of nutriments into the body system: Karen's doctor indicated that her loss of weight and weakness was a result of malassimilation and efforts were being made to find a medical solution. The extent to which someone, or something, looks like another person or something else. 1. The sharing of some qualities, but which are not identical: "They had similar experiences growing up, even though the came from completely different backgrounds." 2. Related in appearance or nature and although they are alike, they are not identical: "Their cats are similar in size and color." 3. In mathematics, a reference to elements with the same shape or angles; such as, geometric figures that differ in size or proportion but not in shape or angular measurements. A quality which makes one person or thing like another one: "The two books share a similarity of ideas; in fact, Ira sees many similarities in them." 1. In almost the same way: "Her friend and she were similarly affected by the new tax laws." 2. A descriptive term that says that two situations, actions, statements, etc. are alike: "Similarly, there will still be some people who prefer to shoot pictures on film even after digital cameras become the norm for almost everyone else." Translation: "Like things are cured by likes"; or, "Similar ailments are treated successfully by similar remedies." "Fight fire with fire." An example of this philosophy may be seen in the doctrine of homeopathy which advocates treatment of a disease by giving the sick person small amounts of substances that would produce symptoms of the same disease if they were given to a healthy person. An opposite belief may be seen in Contraria contrariis curantur, or "Opposites are cured by opposites." 1. A foolish or gullible person who is lacking common sense: If someone is called a simpleton, it usually means that he or she is easily deceived or not very intelligent. 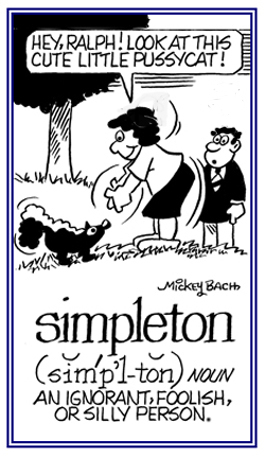 Anyone who believes what most politicians say is a simpleton. 2. Etymology: from Latin simplex, "simple", literally "one fold", from sim-,"the same" + plicare, "to fold". © ALL rights are reserved. A reference to making something easier or uncomplicated and therefore easier to do or to understand: "Sharon developed a simplified presentation of vocabulary words." "The teacher was asked if he could explain the math problem in more simplified terms." 1. To make something easier to do or to understand: "The new software for the computer should simplify the process of creating new programs." 2. To reduce in complexity or extent: "Some people believe that microwave ovens have simplified cooking."